Much of your success in business and personal relationships comes from your ability to communicate your ideas or information to a group. 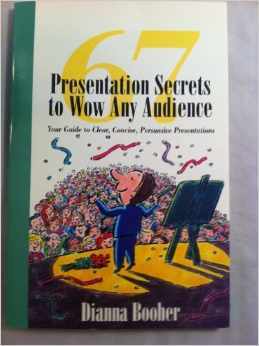 67 Presentation Secrets to Wow Any Audience by Dianna Booher can strip away the fear of speaking before a group by encouraging a natural, animated presentation style for those who must inform, instruct, inspire, persuade, or entertain others. This book includes tips to help you improve both your substance and style as a business presenter and professional communicator. Match your delivery style to content emphasis. Involve your audience and deflect distractions. Modulate your voice quality and pace. Strengthen retention of your key ideas. Select, prepare, and use appropriate visual support. Anticipate and prepare for difficult questions. By applying these 67 Presentation Secrets to Wow Any Audience tips, you’ll add both “punch” to your delivery style and power to your content.